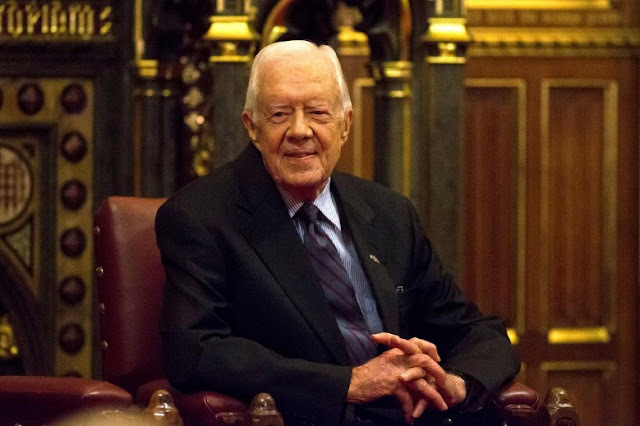 FILE PHOTO - Former U.S. President Jimmy Carter sits after delivering a lecture at the House of Lords in London, Britain February 3, 2016. NEW YORK - Former U.S. President Jimmy Carter said he would be willing to travel to North Korea on behalf of the Trump administration to help diffuse rising tensions, The New York Times reported on its website on Sunday. Former U.S. President Jimmy Carter said he would be willing to travel to North Korea on behalf of the Trump administration to help diffuse rising tensions, The New York Times reported on its website on Sunday. “I would go, yes,” Carter, 93, told the Times when he was asked in an interview at his ranch house in Plains, Georgia whether it was time for another diplomatic mission and whether he would do so for President Trump.